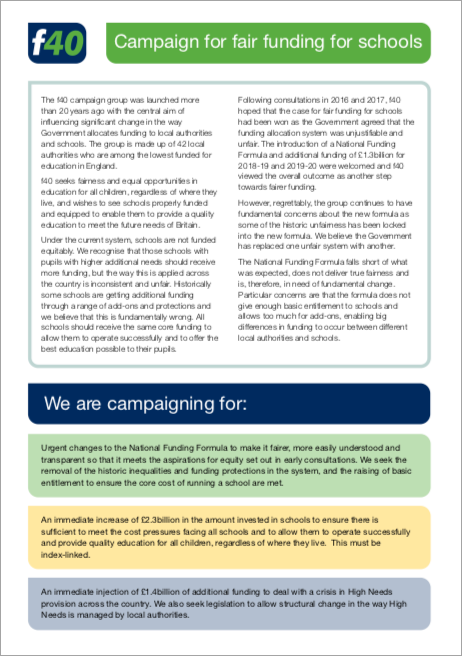 Graham Stuart has today led a Parliamentary debate calling for fairer funding for schools across England, in which over 30 MPs from both main parties took the opportunity to voice their support for funding reform. The Minister, Sam Gyimah, made a significant announcement when he told the House that the Government will bring forward proposals for consultation shortly after the Spending Review announcement by the Chancellor on 25 November. In his speech, Graham referred to figures compiled by the Association of School and College Leaders, which show that the ten best funded areas will receive an average Schools Block grant of £6,300 per pupil this year, compared to an average of just £4,200 per pupil in the ten most poorly funded areas. For a typical secondary school of 920 students, this equates to a budget difference of £1.9 million between the best and worst funded areas, enough to pay the total costs – salaries and pension contributions – of 40 full-time teachers. Graham pointed out that the funding gap cannot be explained by deprivation, pointing out that a deprived secondary school pupil in York who receives the pupil premium – worth fully £935 this year – still has less spent on his or her education than an equivalent pupil in Birmingham who isn’t eligible for the pupil premium. Meanwhile pupils in Graham’s own local authority of the East Riding, which contains pockets of real deprivation in coastal towns like Withernsea, receive the lowest funding per pupil of any council area. Graham said, “The principle that pupils with similar characteristics and similar needs should receive similar funding, regardless of where they live, should be uncontroversial. It cannot be right that some authorities receive 70% higher funding than others. I was very pleased to hear the Minister’s announcement that we can expect proposals for consultation very shortly – schools in my home area of the East Riding have had to struggle with the consequences of the current unfair system for far too long.